So I was lucky enough to get The Stressful Adventures of Boxhead & Roundhead in front of the eyes of bone fide hotshot animator and director Will Finn. Will really did "get" what I was trying to do with the film which is a real thrill. He wrote a few smaller reviews on the Facebooky and we corresponded at length about it via email. With his permission I've edited his thoughts together into something longer and more cohesive. Thanks again Will, it means a lot! 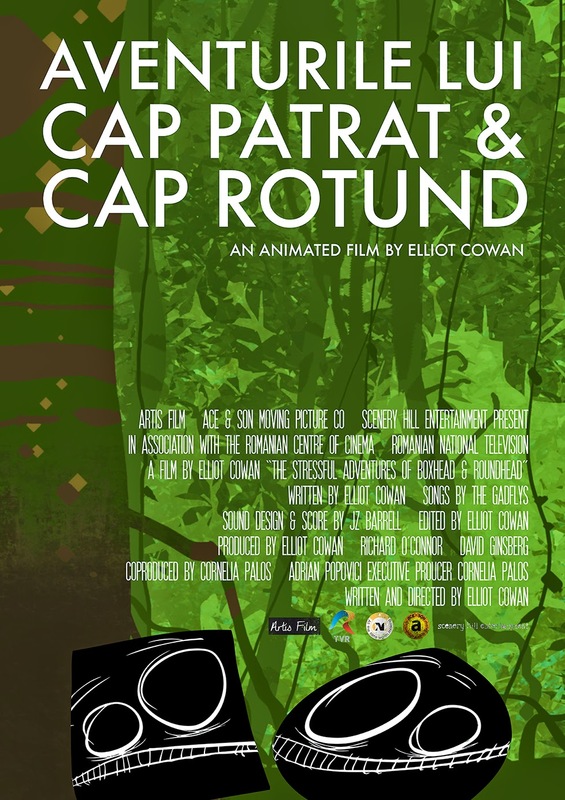 Yesterday I was lucky enough to contrive a viewing of Elliot Cowan’s feature film THE STRESSFUL ADVENTURES OF BOXHEAD & ROUNDHEAD, based on his sparse, darkly slapstick YouTube series. I flat out loved it. In a peak season of highly competitive and remarkably different animated movies, this one sets itself apart through it’s stunning graphic simplicity and organic, individually expressed story and characterization. I’m torn between wishing there were more films like it and wanting it to remain in its own special category. The movie is currently in theaters in Romania and the sooner it can reach screens here the better for everybody. It’s coherent and entertaining but it doesn’t depend on formula. I love that it takes place in a world that feels absolutely real and beautifully designed but not in the typically groomed and regurgitated manner even the best stuff is done in now. I also loved that the dialog in the film felt like conversation. It’s rare in any kind of movie when I hear dialog that sounds like real speech. This movie has that. It’s also rare in movies when something doesn’t feel overworked and massaged to a fare-thee-well, even in movies that are tolerably good. Again, simplicity and minimalism has an appeal I can’t resist. I always say the less you are doing, the more you can make everything count. I think my favorite standup comedians exemplify this; Louis CK, Doug Stanhope, Larry David etc. However he achieved it, there is very individualized energy in all the character animation and even the camera moves. The emotional reality of the guys is palpable without feeling cloying. The unexpected and absurd twists in the story are also a welcome change from the usual “beat board” approach. That he did this on a shoestring, without a set schedule and when it was done it was done. That takes courage, stamina, focus, and imagination. Four things we all need more of. Elliot does the feature medium proud with his intensely engaging minimalism and dark comedy. The graphics are stark and stunning, the characters are indelibly etched and the storyline blends wild action with scenes of absurdity, mystery and even terror. If there isn't a clamor yet to get this movie into the film-fest and art-house circuit, I am going to start one! For those of you in Armenia, B&R will be playing at ReAnimania on October 27 at 11am and 7pm. Screenings continue in Romania where the run seems to have been extended. 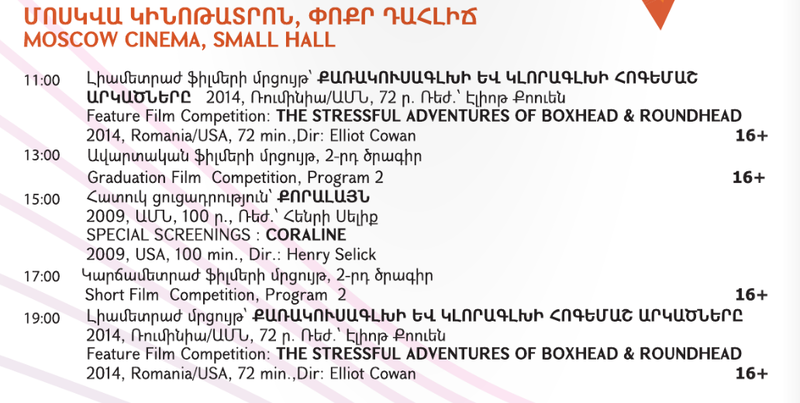 If you're in Romania, you have the chance to see The Stressful Adventures of Boxhead & Roundhead on the big screen!